The coach outing to Mottisfont House and gardens in June 2017 was a great success. The 2017 May Exhibition was opened by Mere artist Laura Rich whose contemporary landscape paintings are sold in galleries across England and are held in private collections internationally. She is also coordinator of Wiltshire’s largest art trail - The Wylye Valley Art Trail which Warminster Art Society is part of. 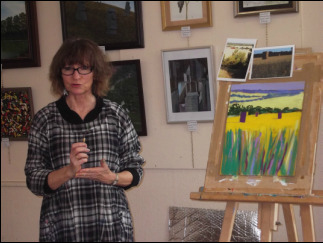 We were delighted to welcome back Internationally published artist Fiona Peart on 22nd April for a Saturday workshop "Understanding Watercolour". Fiona studied drawing and watercolour at the Flemish Academy of Fine Art in Leuven, Belgium On graduating, she was awarded the 'best achievement' prize and then went on to gain an adult teaching qualification. 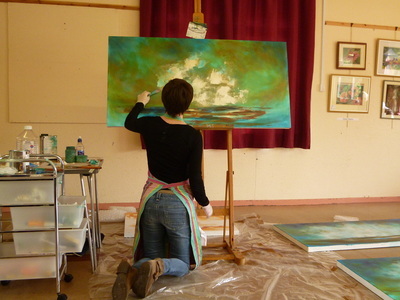 Her work has been exhibited at many galleries including The Mall Galleries in London. A generous and enthusiastic tutor, she told members about the exciting and confounding properties of watercolour - which ones granulated and which flocculated, which ones were transparent and which opaque - and how to achieve the best when mixing colours. She demonstrated how all these properties can be used and then members practised what they had learnt, feeling as though they were using watercolours properly for the first time. Fiona has written seven practical art books, is a regular contributor to the Leisure Painter magazine and will certainly be invited back again. We had a real treat on Saturday 25 March when Christina Hart-Davis held an all-day workshop at the studio. Christina has been a professional botanical artist for almost thirty years, with three Gold Medals awarded by the Royal Horticultural Society for paintings of mosses and lichens and one for paintings of European and Australian terrestrial orchids. She was also botanical artist to an expedition to the rainforests of Sumatra. Her work is held in collections worldwide, notably the Hunt Institute for Botanical Documentation, Carnegie Mellon University, and the Shirley Sherwood Collection of Contemporary Botanical Art. She was a founder Member, and Honorary Secretary for its first ten years, of the Society of Botanical Artists. Christina demonstrated her skill and techniques on specific aspects of her art, such as leaf shine, the ‘bloom’ on fruit and painting white flowers and gave members individual attention and generous advice about their own work. Judith Champion, an SAA artist from Somerset, came to the Studio in March to demonstrate the art of using reeds with Quink or Parker black ink. She explained how the reeds could be trimmed to produce a very effective pen to draw both thin and thick lines. Judith gave a slideshow to illustrate how the ink could be applied and then showed how to create a rainy sky, trees and reeds. Using simple black ink we discovered that blue and even sepia hues could be produced, depending on the type of watercolour paper used. She also diluted the ink with water to produce a paler version for backgrounds and used a water spray to create other effects. 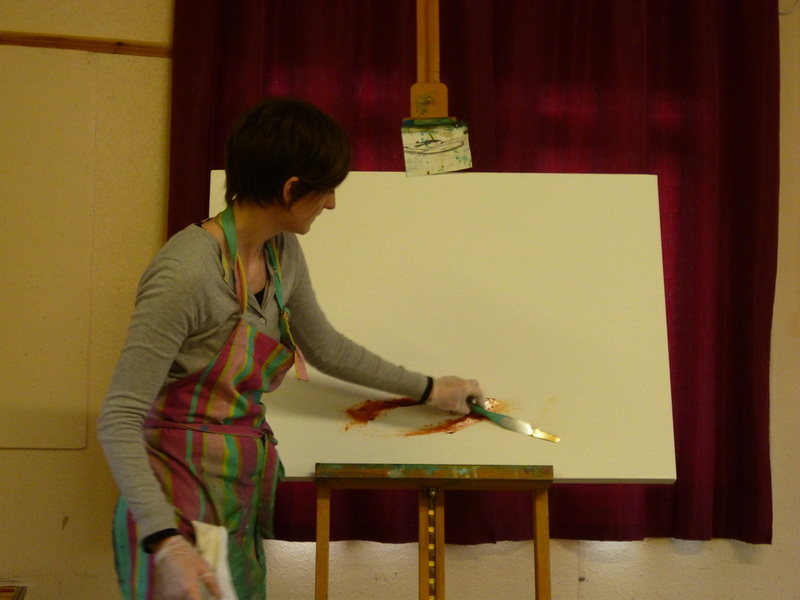 Armed with all this information, members created their own paintings with helpful feedback from Judith. 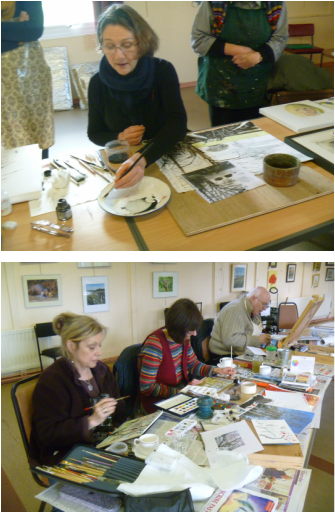 We had great fun In March, when ​Kaili Fu gave a Saturday workshop teaching Chinese brush painting to a group of members plus Sue, a guest who had come all the way from Bristol. Kaili’s desire is to bring Chinese art to the West and she is passionate about introducing people to this ancient oriental skill. Mainly based in Exeter, she runs regular classes, workshops and tutorials for all ages. And for the last ten years Kaili has been running art trips to China where students have masterclasses with some of China's great art masters. ​After her much appreciated lessons last year, Fiona J Forbes returned in February to give two consecutive Tuesday afternoon tutorials of painting in a lively manner in acrylics and oils. After demonstrating, she encouraged members to try her methods and gave useful feedback on our efforts. Fiona graduated from Duncan of Jordanstone College of Art in Dundee, and began painting, exhibiting and doing commissions whilst moving around with her husband and two children. 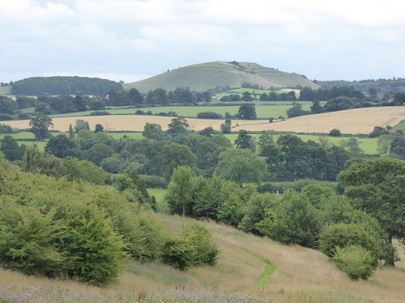 She has lived in Germany, Norway, Wales and France and has now settled in Wiltshire. Living in various countries and meeting people of different nationalities has been a huge influence on her outlook on life and art. She is a member of Artlook and is an Associate member of the Guild of Aviation Artists. Three paintings in two hours! 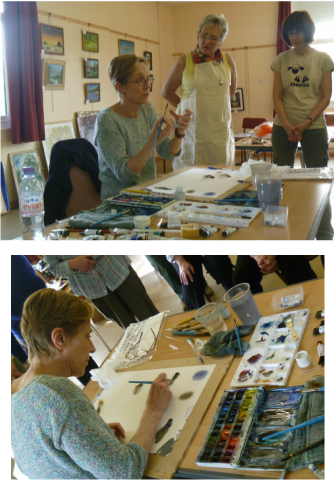 On 24th January, Dee Cowell, internationally renowned for her watercolours, oils and pastel work, gave the Society ​an amazing and entertaining tutorial at the Tuesday afternoon studio session. She shared her techniques and tips for producing the lovely effects which she achieves in her work by producing 3 paintings in 2 hours! Born and educated in Zimbabwe where she taught art at various high schools, she came to England in 1988. She teaches students in her home studio as well as holding classes at local art groups. Her paintings of dogs have been printed as greeting cards to raise money for the charity Hearing Dogs for Deaf People. She has demonstrated on behalf of several companies (such as the Derwent Pencil Company and Daler Rowney) in the UK, Germany, South Africa and Denmark, and is President of the Crowthorne and Sandhurst Art Society in Berkshire. Dave White is a SAA professional associate who focuses on painting animal portrait commissions. He exhibits every year at Crufts Dog Show, the NEC and the New Forest Agricultural Show. But on a Tuesday afternoon in November, his demonstration was a seascape. 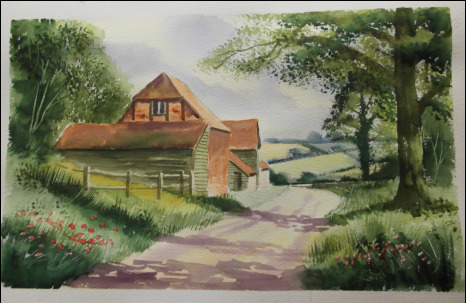 He uses acrylics and enjoys teaching and coaching, demonstrating to art societies and also holds his own classes in Ashley New Milton. Dave is artist in residence for Rhinefield House Hotel in the heart of the New Forest and regularly exhibits and conducts workshops there. ​Thanks to our new projection equipment and large TV screen, members were able to enjoy Dave's entertaining and inspirational demonstration. He has written two books, ‘Ready to Paint Horses in Acrylics’ and his latest publication ‘Sea and Sky in Acrylics’. ​In November our old friend, artist and Illustrator Jane Brayne, returned to share her exciting techniques using sticks, dip pens, reeds and feathers to apply inks, watercolour and acrylics. Members thoroughly enjoyed themselves, painting apples, pomegranates, shells and dramatic landscapes from photographs. Nationally known for her work as an archaeological reconstruction illustrator, (she was the series illustrator for the BBC2 programme ‘Meet the Ancestors’), she has recently published a children's book 'Archer, Journey to Stonehenge'. ​ WAS member, Kate Wilkinson, has a go. was opened by Barbara Savage, the manager of Coates and Parker in Warminster. Guests at the Preview evening voted for Eleanor Free's painting of Cheap Street in Frome as the Peoples' Choice and Barbara presented her with the Alfred Lilly award. The competition at the November exhibition was to decorate a pair of baubles to hang on our tree in the Minster Church during the Christmas Tree festival. Vivien Green's ballooning Santas were the most popular with visitors to the exhibition and she was presented with the winner's prize of £25. Using the Art Society's newly purchased projection equipment, Jane Barne, a Wiltshire artist who specilises in the use of charcoal and pencil, gave drawing lessons on two consecutive Tuesday afternoons in October. Jane studied life drawing at the Slade School of Fine Art and has exhibited at the Royal West of England Academy in Bristol, the Mall Galleries in London and at Wycliffe College, Oxford. For the lessons, very limited tools were needed, the same brand of HB, 2B and 6B pencils, a putty eraser, a knife to sharpen and A3 drawing paper. The same brand of pencil was needed because of the variation in clays, and a sharp knife as pencil sharpener are blunt after the first use. Lesson 1 concentrated on perspective and we were provided with a picture, charcoal and chalk to produce a sketch before proceeding to our pencil drawing. Lesson 2 concentrated on tonal values and still life and members went through the same procedure for as lesson 1. 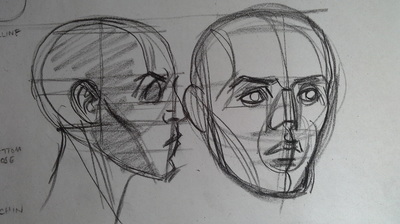 We enjoyed brushing up on our drawing skills, an essential pre-requite for any artwork. 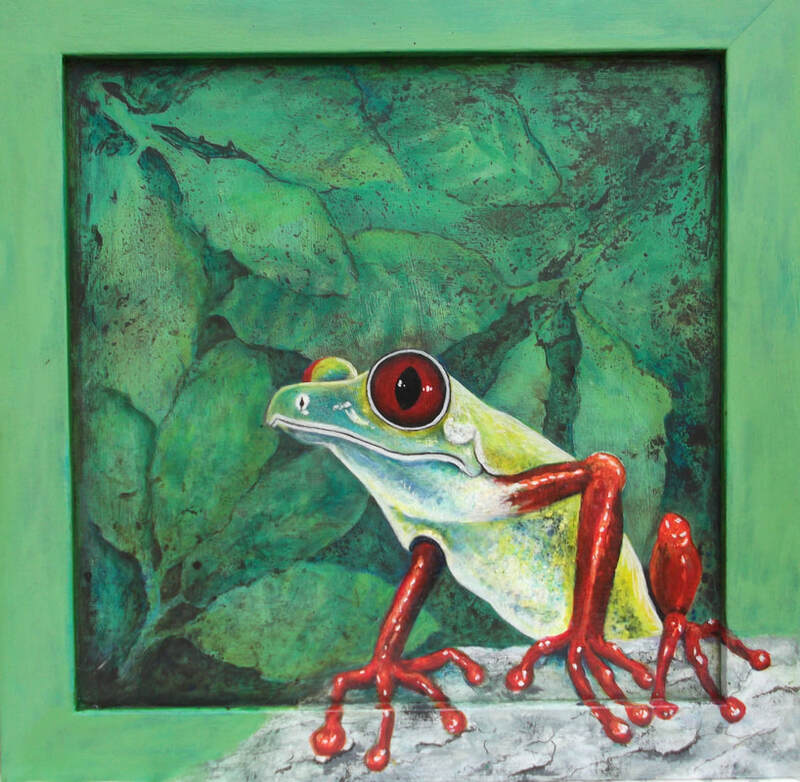 Carole Peart, an artist from Urchfont, is fascinated by detailed and complex shapes, carefully observing nature and wildlife subjects to create at balance of intense colour. Carole uses conventional watercolours (a mixture of Daniel Smiths with SAA and MaimerBlu) and applies coloured pencils (Faber-Castell) to enhance the painting. 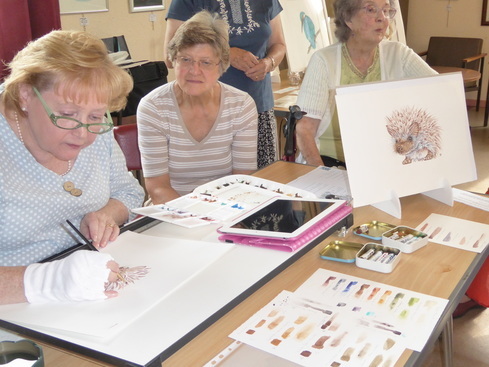 At her demonstration in October she painted a rather prickly hedgehog and members took up the challenge of painting along with her. On an overcast Tuesday in June, Members were treated to an all-day workshop in Warminster Park with Phil Biggs. Phil paints in a very traditional way, outdoors when possible, shunning gimmicks, preferring to just use pencil, brush, lovely artists' watercolours and quality papers. ​He has been influenced by the old masters and by modern painters like Ted Wesson, Edward Seago, Roland Hilder and James Fletcher-Watson. He loves to paint the light and atmosphere of the British landscape and to pass on his enthusiasm and knowledge to student painters. Many creditable pictures were produced on the day, much to the delight of those attending. A day of teasels and inspiration. Sue Rubira trained as an illustrator at Bristol where she gained a BA 1st Class Honours in Illustration, and then an MA at the Royal College of Art in London, after which she moved to Portugal. Sue now lives and works near Southampton, teaching and painting portraits on a personal and commission basis. In 2006 she was winner of the Daily Mail Portrait of the Queen competition and she has had her work exhibited at the National Gallery. At an all day Saturday workshop at the end of May she generously shared her techniques and expertise with the group and demonstrated how to achieve some amazing effects using watercolour and acrylic inks. ​was opened by local contemporary artist and wire sculptor Derek Kinzett, whose work can be found in private collections worldwide. One of Derek's masterpieces sat quietly in a corner, surrounded by admirers. The competition this time was to design a book jacket. Throughout the 2 weeks of the exhibition, visitors voted for the one they liked best. Anthea Hadley won with her painting 'All Quiet on the Western Front. ​On April 9th, Fiona Peart held a Saturday workshop at Warminster Community Centre. 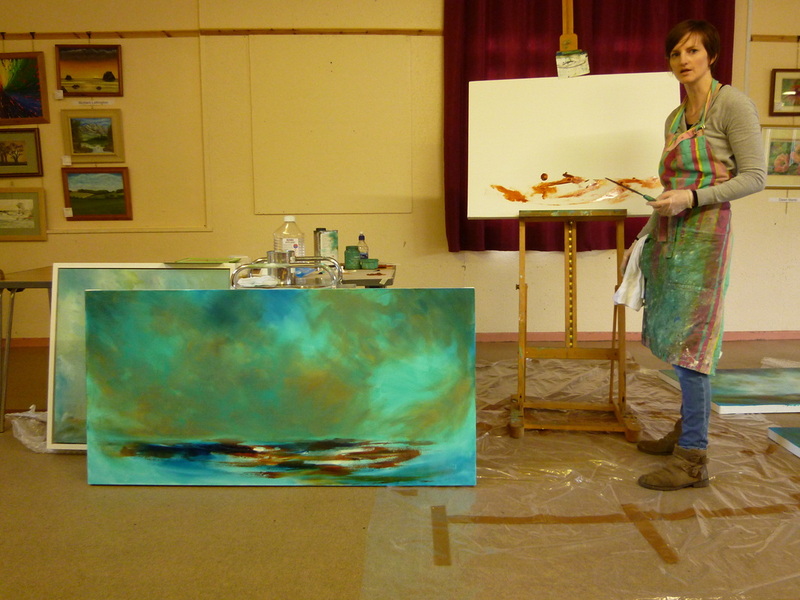 She demonstrated her approach to acrylic painting by first creating a tonal painting using four shades of blue. She showed how to locate the darkest darks and the lightest lights in a subject and then how to distinguish two other tones between, one nearer the light tone and one nearer the dark. Members tried this for themselves and then Fiona showed how to add colour, deciding the tone of the pigment, and how to build up a loose, painterly approach to the finished work. She ended with a helpful and encouraging critique of members’ paintings. Members were deep in bluebells and poppies when Terry Harrison, the well-known artist from the Cotswolds, came to the studio on the 15th March to give a watercolour demonstration. Terry's first painting was a rural scene with a barn, distant trees and fields and a foreground of scarlet poppies. He used a variety of the special brushes which he has designed, including his 'Fan Gogh', to show how to achieve realistic foliage and grasses. Terry had brought a selection of his brushes and books for members to buy. For two consecutive weeks in February more than 30 members, armed with palette knives, brushes, gel medium and heavy acrylic paints, learned the fun of applying acrylic with palette knives, from Fiona J Forbes, the Wiltshire artist. In the first session members produced a small painting on card and, after a further demonstration at the second tutorial, produced larger, more complete paintings. At the end of the sessions Fiona gave a detailed helpful critique. In January, Barry Watkin, a renowned oil and pastel artist from Crowcombe in Somerset, demonstrated landscape painting of the Sussex Downs in pastels. Barry has exhibited with many societies including the RBA, the ROI and the Pastel Society, specialising in landscapes, seascapes, house portraits, flowers and animals. 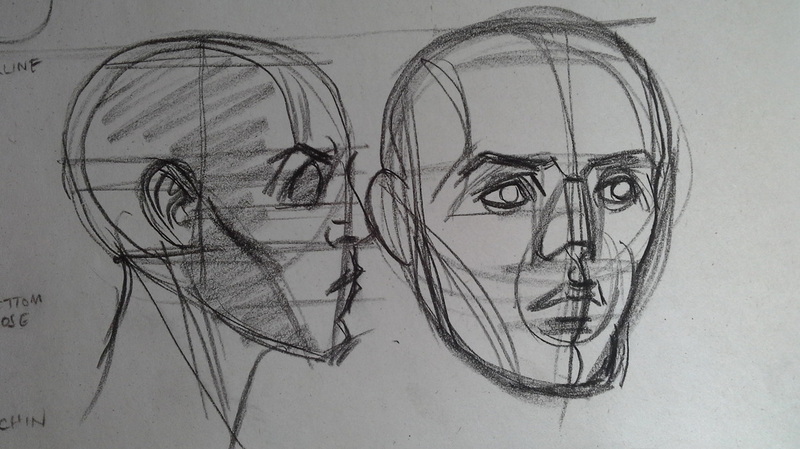 He first sketched using charcoal, emphasising where shade and depth were required in his painting. He then quickly filled in the initial painting using Unison Pastels on Fisher 400 glass paper. At the end of the afternoon Barry presented the finished work to the society to raffle. In March Sean Slater held an all-day drawing workshop. Sean uses the Riley Method of drawing and the first part of the day was spent doing portraits from photographs after watching Sean explain the technique. In the afternoon we had a superb male model - in a kilt - and we were able to draw many different poses using the techniques we had learned. On a Tuesday afternoon in February we were treated to a demonstration by Frank Collict, an artist from Wales. He did two paintings, one of the Brecon Beacons in watercolour and the other illustrated the use of ink, using only a bamboo cane and sharpened match to draw the scene before finishing with watercolour. Members were in for a real treat at a workshop run by Marilyn Allis. 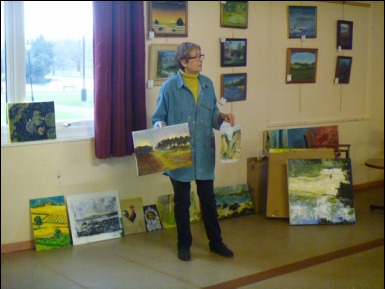 During the day Marilyn demonstrated three paintings in her loose impressionistic style then helped everyone to produce two creditable paintings. Marilyn uses strong vibrant colours to capture the movement and energy of a scene; her work can be seen at exhibitions across the country. Laura Rich, who lives in Mere, Wiltshire, was commissioned by P&O to produce 64 contemporary landscape paintings to adorn exclusive accommodation aboard their new ship, Britannia. She demonstrated the various stages each painting underwent from a blank canvas through to the final painting in a myriad of vibrant colours. 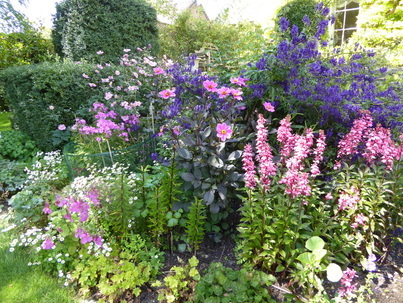 Members visited Merfield House, Rode, on the 10th June, kindly hosted by Mr & Mrs D James. 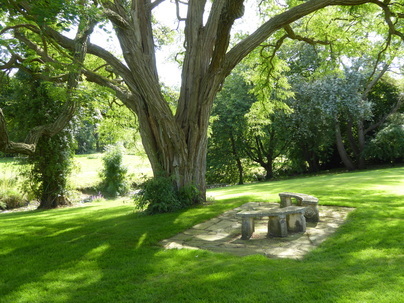 They were able to paint at several locations within the beautiful grounds on a lovely summer day, as shown in the photograph taken in the walled garden. 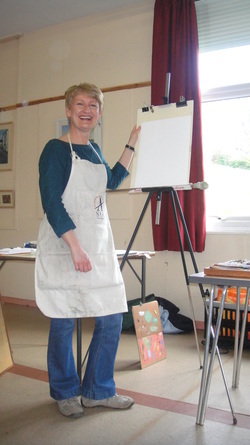 In March Wiltshire artist Carol Kibble gave a demonstration in the use of pastels. Carol’s favourite subject is British wildlife, but she has recently become well known for her paintings of racing cyclists. She told members that she prefers pastels to all other media because of the depth of colour and the detail she can achieve. Carol has loved drawing from childhood, but at school she was encouraged to study more academic subjects in order to get “a proper job”. After years working for an insurance company, Carol took the plunge and became a self-employed artist. She now divides her time between exhibitions, commissions and teaching and runs workshops and courses. After her demonstration, she encouraged members to experiment with pastels, giving each member individual attention. 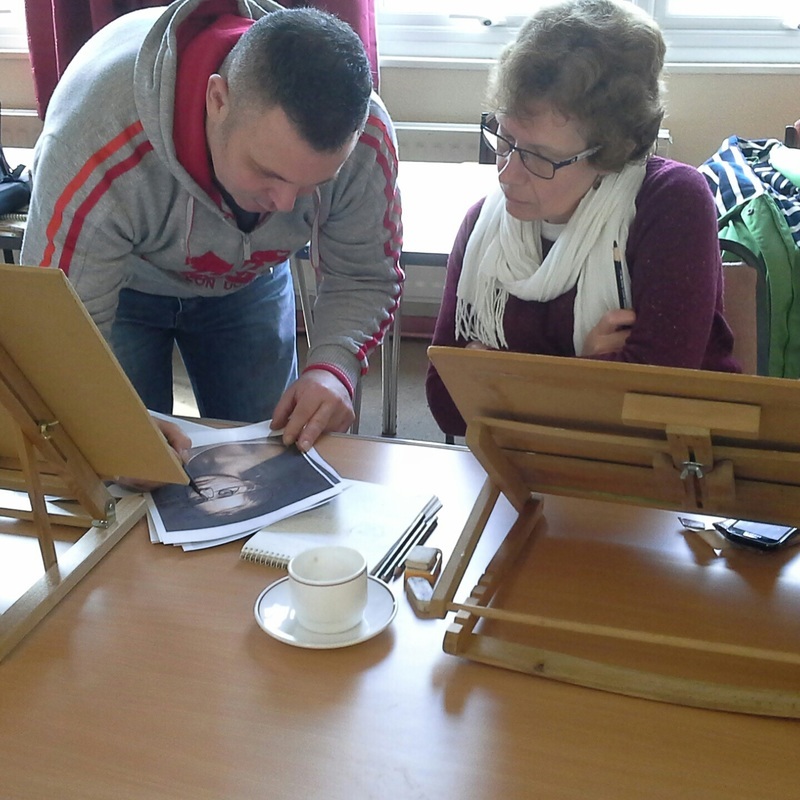 Portrait artist Sue Rubira held a Saturday Workshop in March on Playing with Watercolour. Sue studied illustration in Bristol before moving to do a Masters Degree at the Royal College of Art. She won the Daily Mail competition for an 80th birthday portrait of the Queen and in 1980 she was commissioned to make an engraving that was deliberately burned in the climatic scene of Granada Television's The Jewel in the Crown series. She has been teaching watercolour for 25 years. Sue explained the science behind watercolour techniques and how different mixtures of paint behave. She demonstrated how different colours reacted in a wash, and passed on techniques to show how to control wet-in-wet watercolour. ​The group practised these techniques and then applied what they had learned to painting realistic looking feathers. throughout the country. She is currently writing and illustrating a comic strip book for children about the Beaker People and Stonehenge. Jane is best known as the series illustrator for the BBC2 programme ‘Meet the Ancestors’. One of the images she created was of the famous ‘Amesbury Archer’ which can be seen at the British Museum. The grave of the Amesbury Archer was excavated by Wessex Archaeology in 2002 about two miles from Stonehenge. 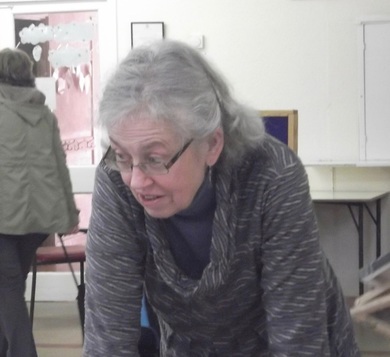 Jane shared her talents as an artist and illustrator with Warminster Art Society during a Saturday Workshop. A group of students were taken through the skills of using water colour washes, and creating images by applying ink and water colour using pens, brushes, sticks and sharpened reed pens. The students were also introduced to the advantages of using gouache paint and were encouraged to experiment and break the rules to create some interesting landscapes. 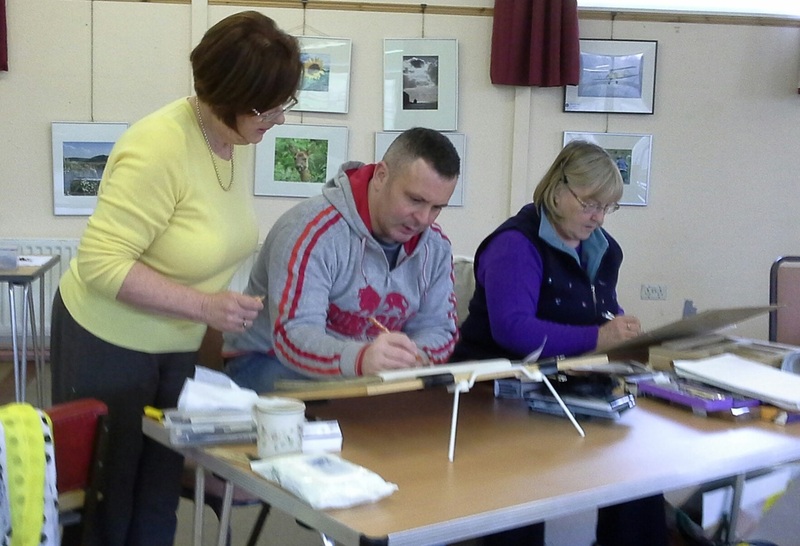 More than 30 members came to the Park Community Centre at the end of February for an afternoon’s talk and demonstration on landscape painting using water colour – renowned as a difficult medium to master. Artist Max Hale chose a village street scene with buildings receding into the distance. He applied pale colourful washes to depict the cottages, later skilfully adding the details to the dry wash. The painting was completed within the two hour demonstration and in fact Max recommended that, when painting out of doors, the artist should always aim to capture the scene within two hours before the shadows and weather conditions alter too much. Max Hale gained a fine art degree at Harrow Art College and then went on to work as a story and magazine illustrator. Since then Max has used his strong graphic skills and further developed his love of painting using a particular broken colour technique which gives his audience something to discover within his work. Max writes for The Artist magazine and has recently won a prize for ‘Eager Feeder’, a painting in oils for the Patchings Festival. Rob Savin, who works as a keeper at Longleat in addition to being a very accomplished artist, returned to the studio in January for four consecutive Tuesdays of lessons in acrylics. He took a photograph of a colourful macaw for the students to paint and demonstrated each stage of the process giving hints and tips to students as the painting progressed. As you can see the results are fantastic and everyone had great fun. ​At a Saturday workshop in January, Annie Monk led members through a wonderful experience experimenting with acrylic paint, pallet knives, oil pastels, collage and a kaleidoscope of colour. Annie is largely self-taught, and although she initially attended tutored workshops, she then developed her own very individual style. 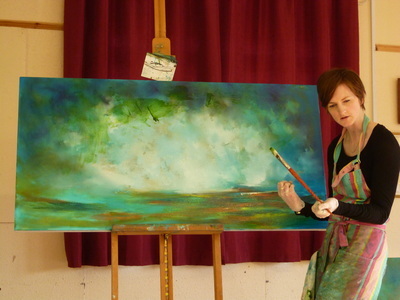 She now works with acrylics and mixed media, painting quickly and instinctively and allowing her pictures to evolve.